Please note that this may also have been called the "Mr. Hodges burial ground". Land deeds apparently indicate that the land was sold by a "Mr Crow" to a Mr Hodges on 10 Feb. 1838. It was apparently then sold to someone else in 1857 or 1858. Further research would be needed to complete the ownership path. 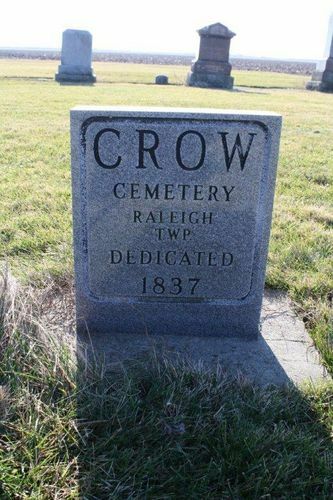 The Crow Cemetery was dedicated in 1837. Stan Wannacott mentions also that they bought the farm from the Crow family who had owned it for a VERY long time. Thus after Mr Hodges owned it, at some point it was sold to the Crow Family again. Stan mentions two or three burials there when he was a boy and then none after. He mentions that this seemed to be primarily a Crow and Johnston Cemetery. In the early 1900's the cemetery had gotten into really bad shape. Then, a member of the Crow family began to keep it up nicely. Then later the Wannacotts took over. At one point the few known stones were placed in a row in cement. Sensing by dowsing indicates two distinct features. At the back of the cemetery are two rows of burials end to end with no breaks. If this was a family plot there would be empty spots. However, the burials there are solid with no blank spots indicating some kind of "Communal Area" or "Special Area" of some sort. It is unlikely we will ever understand these areas for certain. This may have been a "Singles" burial area, or could have been some sort of Potter's Field. Or possibly some other reason for it's existence? This is now long lost in history. Just toward the road from there and right against the North East side (Facing London) are 4 rows of baby burials. One count of one row shows about 20 burials. Thus indicating possibly about 80 burials of very young children there. This is surprising since this is a small cemetery, but everything points to that. Elberta Crow has told us that an 'elderly woman' told her there were more graves under the road (i.e., the road had been moved, at some time, and now is on top of some of the early cemetery). See more photos of the Crow Cemetery.